Investors should know by now that the conglomerate Lippo Karawaci (Lippo) are facing cash flow issue, bring uncertainty to their Reits, hence their ability to pay rent to First Reit. Paying the rent in SGD made things worst as Rupiah deprecates against SGD. Lippo mall price had crashed in terms of its yield affected by the falling Rupiah. First Reit's yield isn't affected but sentiment is bad and hence has fell below NAV. Base on Stockcafe stats, First Reit is the number one shares that stockcafe users are buying. 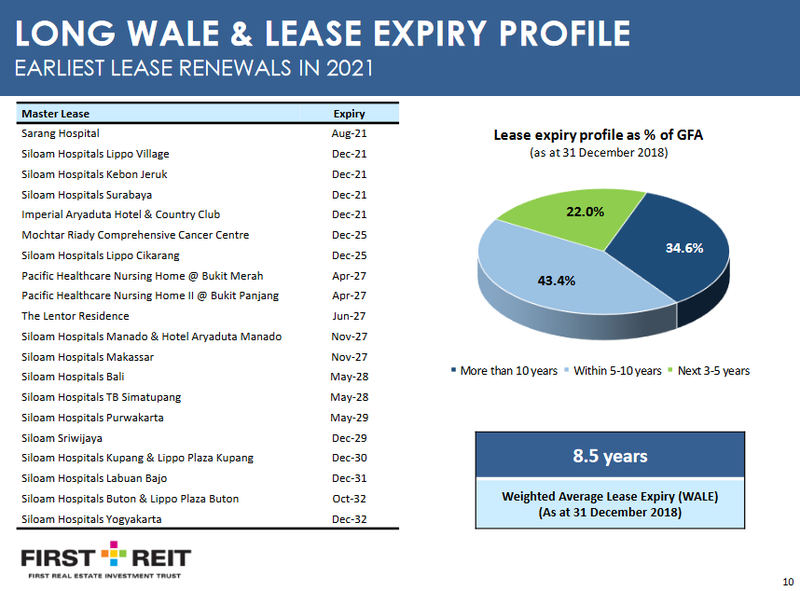 Although cheap I am wary to jump into the reit as Master lease will expire in DEC 2021. As Rental fees are not recorded separately, I will have to make do with General & Administration Expenses(GAE). If you have not already notice, the GAE is growing much faster than the top line can climb. And we shall see how the bottom is like. 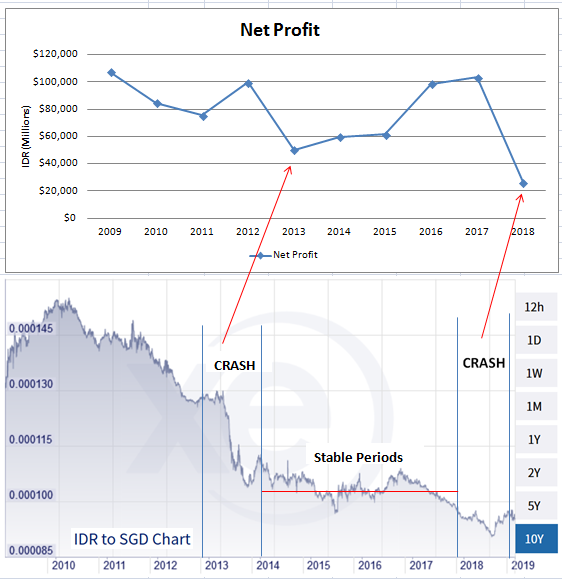 Net Profit CAGR is -14.46%, forming newer low in 2018. 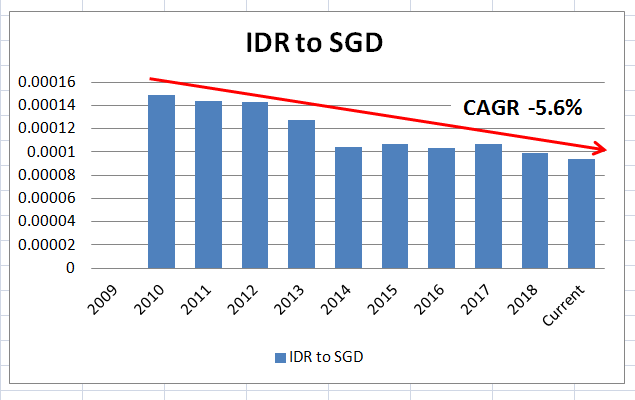 I believe this is due to the fall of Rupiah and Lippo has to paid rent in SGD. The deprecation of Rupiah is relentless over the long term. I believe it will be of Lippo interest to change the payment of some sort if not of Rupiah. First Reit current yield is 8.7%. Assuming Lippo wants to stop paying in SGD, affected income will be affected by 44% base on GFA in the next 3 years. As for how much lower is will the income be affected? Rupiah has depreciate 37% since 2010, if it was to be adjust accordingly, income for First Reit will likely drop 37%. It could be a lower drop depending on how it is structured. What I have done here is speculation of a possible and the worst that could happened. Lippo may decide to carry on to pay in SGD. If one is to invest in First Reit now, I think the risk reward is good. Taking 8.7% yield for 2.75 years and a possible drop to 7.3% for another 4 years till the next round of expiry. Lippo although with cash flow issue, with their assets, there is a low chance of default or bankruptcy. However that will affect First Reit share price if things deteriorate. I think it is worthwhile to collect the dividends and wait for the plans for the mater lease to be updated in 2021. Rights issue may happen for future acquisitions, which may or may not be a good things, as long not like OUECT. Honestly, to save Lippo Healthcare bottom line, the rent fees in SGD is highly likely to stop.